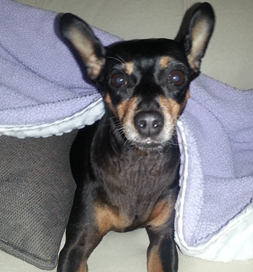 Maureen and Dave Simpson of North Wales, PA, were heartbroken after the death of their beloved Miniature Pinscher at the age of 16. “I teared up or cried whenever I thought about Lucy even for a moment or two,” Maureen says. Read Lucy’s story in Maureen’s words. She and Dave thought they were too old to start over with another dog, wondering if he or she would outlive them. But she was longing for a pet, and after about a year, she began looking on Petfinder, which she described as “torturing” herself. Then one day Dave asked if she wanted to get another dog. “How can we; we’re too old aren’t we?” she replied. But the thought came to her that they could adopt an older dog that would be a good fit. Lucy’s pet notes on Petfinder said that her pet parent had died and none of the family wanted the six-year-old dog, so she was given away. She ended up at Animal Rescue Force (ARF) in East Brunswick, NJ. “We were sure the Animal Rescue Force would want someone younger than us to adopt Lucy, but we wanted to try,” Maureen says. So they set off on the three-hour round trip to New Jersey. “We were the first ones to arrive at the [adoption site] and waited anxiously. After talking to a rescuer, we were told not to worry that we would get Lucy. It was too good to be true. Too old to adopt a dog? Hardly. When the three of them are hitting the road in their RV and enjoying walks on the beach and hiking, the Simpsons now find themselves laughing at such a preposterous idea. You’re never too old for a new friend.